The lighting in our house plays an important role in creating an atmosphere of comfort and warmth, harmonious decor. We try to carefully choose the lighting, focusing on the features of the interior, on personal preferences and on the cost of the device. And often the high cost of illuminating devices prevent the purchase right product. In order to save you can make a lamp with your own hands. The original decision will look good in the bedroom and in the living room. yarn (preferably cotton),balloon, any fat (sunflower oil or lard, marker, starch. In order to make a lampshade , take an old table lamp. 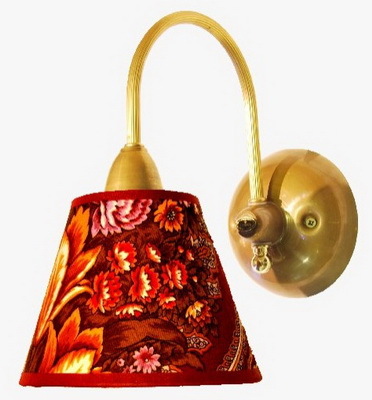 Lamp will fit perfectly into your interior, if used for shadeand leftover fabric from the curtains that hung in the room. Make measurements of the height, bottom and top of the lampshade. It is more convenient to do a common thread, which then attach to the lineup. Fold the cut fabric in half and cleave the needles. Cutting fabric "on the bias", because in this case the material is stretched, and our new case-the shade looks on the lamp as a new elegant dress, tailored strictly on the figure. Mark on the fabric with chalk (soap) upper and lower line of the lampshade. Connect the edges of the top and bottom lines. Make allowances for seams: the top and sides and 1,5 cm, bottom – 2 cm the edges seam "zigzag". The top and bottom edges and tuck keen, then sew on a typewriter. Fold the fabric in half, make the basting and sew side seam, leaving the bottom about 1 cm. Pin thread the elastic into the bottom seam of the cover, sew the remaining seam. Put the finished cover of the old lampshade and fasten with a needle and thread. Mount not very carefully, because in the future you will need to remove the shade for washing. You can find more simple solution to create shadeand with their hands. Inflate the balloon and draw a marker at the base of a place that will not stick up yarn. Cover the bowl thoroughly with fat. Cook the starch and place the yarn for a while. Then wind a ball of yarn in random order. The degree of density or transparency of the shadeand depends on you. Wait until the yarn dries, and blow the balloon. Insert the elements of the electric system (cartridge, light) and attach in the right place. 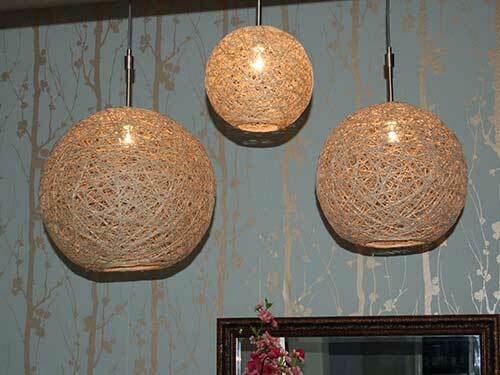 This lampshade makes a wonderful decorative solution in your interior. Lampshade with their hands. Old furnishings and decor in the hands of talented designers and decorators gain a second life. Moreover, these objects become unique and original. You can play with the shapes and sizes of plates. Today, lampshades and floor lamps, hand made, valued not less than the factory, so Your house guests will surely note such a decoration piece. In Soviet times, produced a very beautiful table lamps. But over time, their shades were dull, damaged – in General, lost their form. And throw a pity someone is the memory of the grandparents of grandparents, someone just like them. Lampshade for floor lamp with your hands. The first option. Double sided tape, decorative tape, glue, desktop (preferably resistant to fading) or a poster, scissors, utility knife, tape measure or sewing meter.